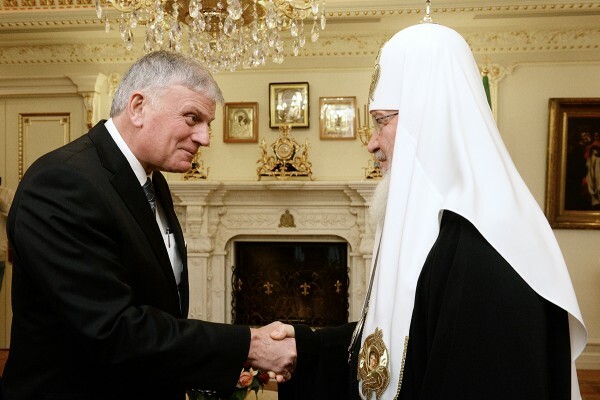 On 28 October 2015, His Holiness Patriarch Kirill of Moscow and All Russia met with William Franklin Graham, President of the Billy Graham Evangelistic Association. They were joined in the meeting hat took place at the Patriarchal and Synodal residence in St. Daniel’s Monastery in Moscow, by Mr. Viktor Hamm, Vice President of the Association, and archimandrite Philaret (Bulekov), vice-chairman of the Moscow Patriarchate’s Department for External Church Relations. His Holiness Patriarch Kirill noted that the founder of the Evangelistic Association, the Rev. Dr. Billy Graham had visited Moscow several times, even in the Soviet period in the 1950s and in the 80s, when he addressed Orthodox worshippers in the Yelokhovo Cathedral of the Epiphany. His Holiness Patriarch Kirill noted with appreciation good relations between the Russian Orthodox Church and the Billy Graham Evangelistic Association, mentioning with gratitude common work for supplying humanitarian assistance to the refugees from Ukraine. His Holiness touched upon a topic of spiritual foundations of modern Western civilization. “The Russian Orthodox Church was active in developing relations with Western Christians even during the ‘cold war.’ We lived in hard conditions in the state in which the atheistic ideology was dominant and thought that Western civilization was Christian. We highly appreciated the freedom of Christian Churches in the West and their influence on public life. For us, Western Christians were like brothers and sisters. They were our allies. His Holiness Patriarch Kirill expressed his support to the guest in his courageous stand for the Gospel truth. William Franklin Graham conveyed greetings from his gather, the Rev. Dr. Billy Graham, to the Primate of the Russian Orthodox Church and said that it was a privilege for him to meet with His Holiness and thanked him for raising his voice for the truth in the world which experiences moral hardship. He added that it important to work together supporting Christians throughout the world who stand for the truth. Franklin Graham expressed his particular concern over persecution of Christians in different regions of the world, especially in the Middle East. As to other aspects of international cooperation, Franklin Graham mentioned the necessity of common efforts in rendering help to the refugees from Syria and Afghanistan in Europe like the help given to the refugees from Ukraine to Russia. The guests told His Holiness about the Association’s work with the youth and children, about social ministry and Christian education and expressed his hope for cooperation with the Russian Orthodox Church in different fields of action. Franklin Graham expresses his gratitude to the Russian Orthodox Church and her Primate and said that he had prayed to God to keep His Holiness and give him strength to uphold moral positions and the truth of God’s word in the rapidly changing world.